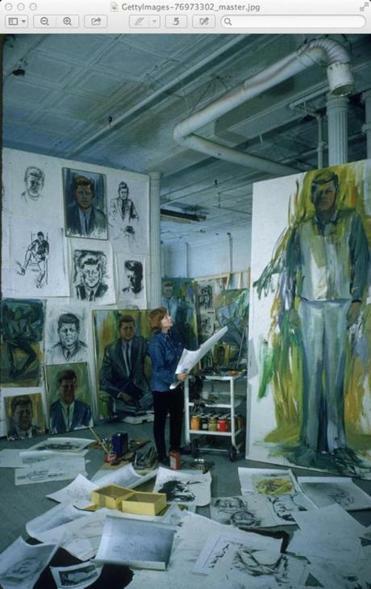 Artist Elaine de Kooning among John F. Kennedy-themed works in an undated photo. There’s a lot to like about “A Generous Vision: The Creative Life of Elaine de Kooning,” including the story it tells about the painter’s portrait of President John F. Kennedy. To its credit, the biography by former Los Angeles Times staffer Cathy Curtis does not dwell on its subject’s celebrated spouse — abstract expressionist Willem de Kooning — but instead trains its focus on the painter herself. Toward the end of the book, Curtis writes about de Kooning’s painting of the president — perhaps her best-known work. The large, 102-by-44-inch canvas had been commissioned in 1962 to hang in the Harry S. Truman Library in Missouri, and was finished three years later. The book details the time in between, including interactions with Kennedy’s young daughter Caroline, a visit from the president’s sister Jean Kennedy Smith, and the assassination of JFK just two days after de Kooning finished three portraits of the president. His death rendered her unable to paint for a time. The painting of JFK, which hangs now in the National Portrait Gallery at the Smithsonian, is revered for its unusual style for a presidential portrait. In hues of green and gold, brush strokes depict the president in a seated pose, legs crossed. Sans jacket, Kennedy has distinctive features and an inquisitive expression. In her 1965 dedication speech, de Kooning explained her artistic take.